Waveguides, like other external conductors that penetrate the facility shield (Faraday cage/EMI/RFI shielded room), can allow transients to propagate.A waveguide should make continuous contact with the facility shield around the entire periphery or the waveguide combination. 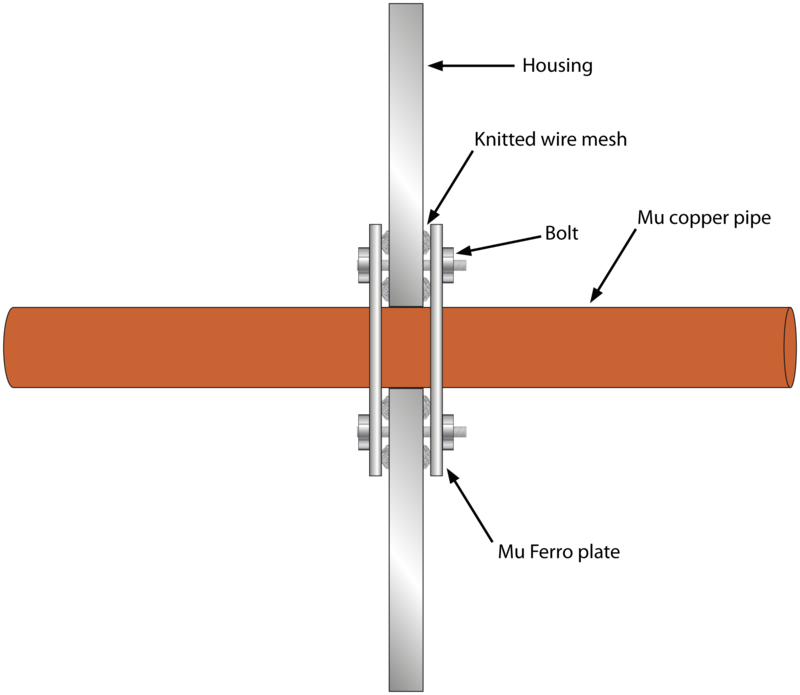 All of the waveguide current would then flow onto the outer surface of the facility shield; the external transients could only penetrate to the interior by diffusion through the waveguide or facility wall. This continuous peripheral contact between the waveguide and the shield is achieved by a Mu-ferro plate and electrical conductive knitted wire mesh gaskets. Waveguide feedthroughs are available in most sizes for water, gas, optical data cables or air. Specially designed waveguide feedthrough assemblies are used for transporting non-conductive gases or liquids into an EMI/RFI or EMP shielded enclosure / Faraday cage. These assemblies vary in sizes and materials. Accomodate requirements such as fire suppression systems, hydraulics and other utilities. Honeycomb waveguide insert option available for high frequency or gaseous applivations. Dielectric unions are available to maintain isolation from ground. Penetrating Faraday cages and EMI/RFI/EMP shielded rooms for water, gas, optical data cables or air. WGFT-127 127 mm 1524 mm 7/8"
WGFT-190 190 mm 1524 mm 1-1/8"
WGFT-254 254 mm 1524 mm 1-3/8"
WGFT-318 318 mm 1524 mm 1-3/4"
WGFT-381 381 mm 1524 mm 1-15/16"
WGFT-508 508 mm 2032 mm 2-1/2"
WGFT-635 635 mm 2032 mm 2-7/8"
WGFT-762 762 mm 3048 mm 3-5/8"
WGFT-1016 1016 mm 5664 mm 4-5/8"